Madame Tussauds, the wax museum dating back to the Paris of 1770, founded by wax sculptor Marie Tussaud, formerly known as "Madame Tussaud's"(the apostrophe is no longer used). It was opened in Bangkok in Dec, 2010; A lot of dolls who are famous in Thai and in the world are displayed such as Thai royal family, Princess Diana, Barack Obama, Tiger Woods and so on. The picture is one of them; Tony Jaa, the action movie star in Thailand. Have you ever watched his movie, Ong Bak: Muay Thai Warrior ? Putting the story aside, his action was very impressive. Kanchanaburi is located west of Bangkok and famous for the Bridge on the River Kwai because of the movie " The Bridge on the River Kwai ". The dolls in the picture we found on the way to Kanchanaburi from Bangkok looked very happy. Very good location near the beach. When you go into the restroom in the lobby, the sofa (see in the picture) will welcome you. When I went there, I was wondering if I got lost in another space. I was almost going back. Hmmm, other hotels around here offer the same ? Phetchaburi (Phetburi) is in central Thailand, about 160km south of Bangkok. I found a cat around Cha-am beach. In the Ancient City (เมืองโบราณ) in the suburbs of Bangkok, I saw Doraemon or Ultraman shaped gift pots. Is it Boosuka or just a bear doll ? The Airport Rail Link is the rapid transit line in Bangkok from Suvarnabhumi Airport to Phaya Thai station in central Bangkok. no. 174 - Ramen Rider ? Talad Khlong Suan, famous for 100 year market (ตลาดคลองสวน 100 ปี) This market has a long history and a lot of shops there. When I was walking around, I saw an interesting T-Shirt like in the picture right. The T-Shirt says not "Kamen Rider" but "Ramen Rider" in Japanese. Ramen Rider ....? I love Thai dance ! This is a scene at the famous praying spot in Bangkok, Thao Maha Brahma - ท้าวมหาพรหม in front of Grand Hyatt Erawan Hotel in Bangkok. Thai dance in thanks for a dream came true. This is called Kao Laam. It's difficult to guess what they are. They sell only bamboo ? Of course, not. 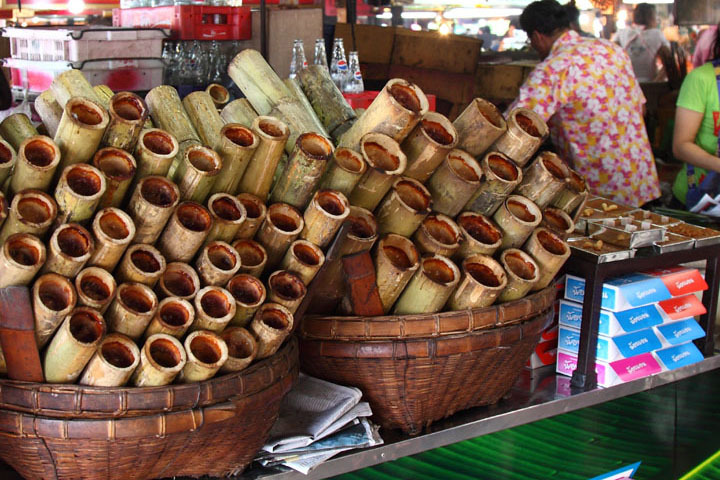 They are tasty Thai food dish; Sticky rice mixed with sugar and coconut milk, baked in bamboo sticks. I tried it long time ago and I'm afraid I don't remember how it tasted. 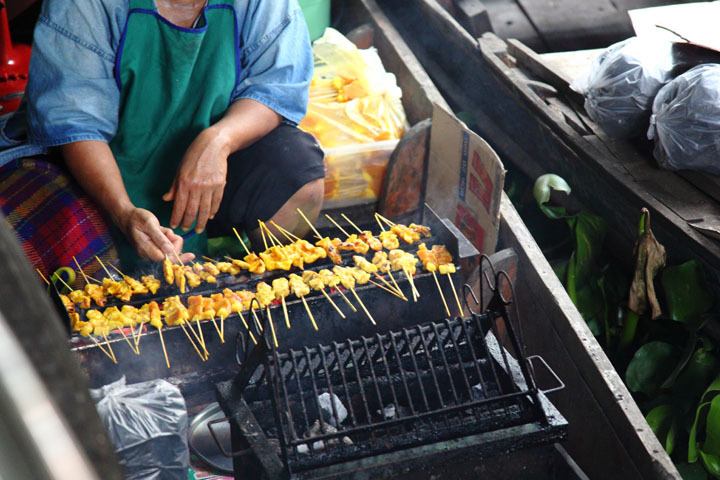 This is the floating market in Bangkok, Taling Chan Floating market.